Spotting locations from Happy Valley has been a highlight of my recent visits to Calderdale. Not content, however, I embarked upon a journey to see some of it being filmed. 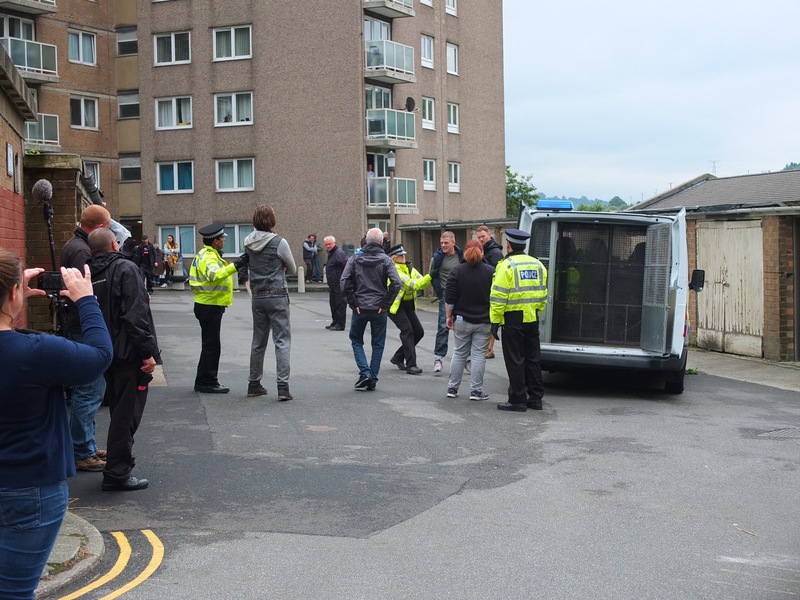 It was amazing to see the work and dedication which goes into a single scene of television drama, which will amount to a matter of moments on screen. They say it ruins the illusion to know how the trick is achieved, but I think today has made television all the more magical for me and even more certain that I want to be involved in it, somehow. At the same time, however, it has been a sobering experience. I want to work in telly. I watched Sally Wainwright, directing, and I was aware of her singular vision. Her stubbornness and desire to pursue that vision. Sarah Lancashire is an absolute master at her craft, it was an honour to watch her work. Everyone on that set worked incredibly hard, going over the same scene over and over for hours [spoilers: it looks amazing! ], and I know the outcome will be some of the best telly there is. Perhaps I should have picked a less daunting group of people to observe. I guess, when faced with the reality, you either rise to the challenge or you give up. I’m not giving up.